Stop by an Open House for a free coding trial with Scratch or Python. Parents can meet the instructors and talk about the different classes. 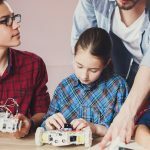 Students can join a free coding trail and test out some of the devices likes LEGO robotics, micro:bits, and more. Please RSVP so we can make sure there is a computer for every kid.